New case for playing live. I’ve been intending to sort out a proper case for the synth for a while. 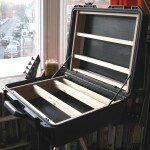 While it worked fine at the time the rough case I’d knocked up it wasn’t ideal for playing live.